WISEUP 16GB Indoor Hidden Security Nanny Cam Picture Frame Motion Detector Spy Camera with Audio and Video Recording | The Best Spy Tech Store Online! 【Picture or Photo Frame Spy Camera】 This is a desktop motion detector camera just like a real frame, you can change the inside picture or photo at will, in the meanwhile you can use it as a pinhole spy camera too. 【Multifunctional Spy Camera】 In addition to video shooting and recording, this house security camera also supports snapshot function. 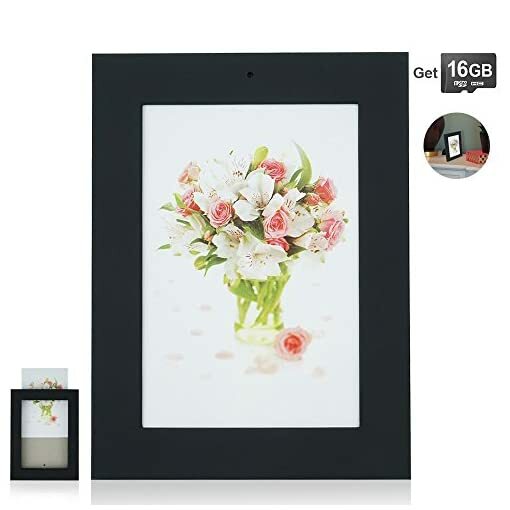 【Motion Detection Video Recording Function】 This picture frame hidden camera is set with motion detection video recording mode apart from manual video recording mode, it could extend the camera standby time by using this motion detection video recording mode. Please input the product model “AT002” on our download center to download the manual. If for any reason you are unhappy with any product by WISEUP, please do not hesitate to contact us. We will do our best to solve your problem quickly and efficiently. 【Video Storage】 This home surveillance camera uses micro sd card to save video files and supports 64GB micro SDXC Class 10 sd card in max. We have built a 16GB micro SDHC Class 10 SDHC Class 10 sd card in it before ex-work, which can save around 170 min video footage. We suggest you to use a micro SDHC Class 10 sd card with larger capacity if you want to store more video files. 【Operating Battery Life Time】 This pinhole spy cam can work for about 50 minutes after fully charged, while it will take about 2 hours to obtain a full charge.